The district includes all or part of five small contiguous subdivisions of land: Petrus Heights (the largest), Mattie O. Ball, Mimosa Place, Kent Addition-East of MacArthur, and DeSelle (the smallest, with only five lots). Their plats date from between 1937 and 1942, although they did not develop until the post-war years. 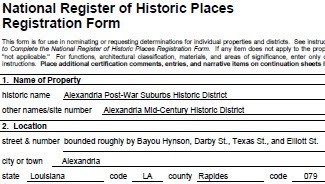 Because it would be inaccurate and misleading to name the district for any of the subdivisions, the name Alexandria Post-War Suburbs Historic District was chosen. All of the subdivisions are examples of land subdivided by private landowners (known as “subdividers” in modern subdivision history terminology). Individuals then purchased a lot and built whatever they wished. This is in sharp contrast to the look of subdivisions developed by “merchant builders,” wherein a developer purchased the land and built the houses to various models. The “subdivider” development pattern is responsible for the greater variety (and greater architectural interest) found in the nominated district. It also appears that some of the houses (a minority) may have been speculatively built – i.e., a contractor bought a few lots, built some houses, and sold them. The layouts of the five subdivisions noted above follow a traditional city grid pattern, although the blocks are typically larger and the lots much wider. There is a notable absence of the curving streets and cul-de-sacs so typical of subdivisions laid out in the post-war years. Blocks are square, rectangular, and irregular in shape (the latter due to three angled streets (Kimball, Hunter and Pierson – see map). Kimball Avenue takes its orientation from Bayou Hynson. Elliott Street is a continuation of the same named street that begins in an early twentieth century suburb of the city. Otherwise, the district’s streets were cut when the subdivisions were platted. As is typical of post-WWII subdivisions, any given house is located roughly in the middle of the lot with a broad expanse of lawn in the front. The large lots with ample front lawns epitomize the escape-from-the-crowded-city concept that was much a part of the suburban rationale. In terms of designed landscape features, there are a notable number of period low planter boxes built of the same brick as the house. City directories reveal the pace of construction in the district. In the immediate post-war years, twenty-three houses were built. Clearly the period of intense construction was 1951-56, when half of the district’s houses were built. Roughly one-fourth were built in the late 1950s/early 60’s.